Ford brings its A-game to the B-segment. USDM Fiesta specs announced. 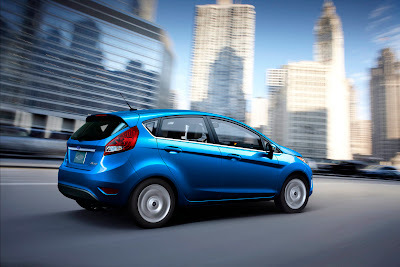 The first reports about the 2011 Ford Fiesta are coming out of the LA Auto Show, and they're good. 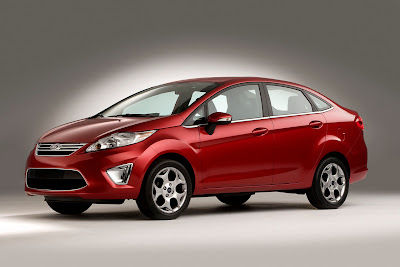 For starters, the Fiesta will come with a 1.6 liter engine making 119 hp and 109 ft./lbs. or torque, mated to either a five-speed manual or six-speed dual-clutch automatic. The DOHC engine features Ford's Ti-VCT, or Twin Independent Variable Camshaft Timing. All this goodness also means frugality at the pump, and Ford went all-out: 30 MPG city and 40 MPG highway with the automatic. That's class leading. Also class leading is the Fiesta's interior, which looks nearly unchanged compared to the Euro-spec models—a very good thing. There's cloth or leather seats with a 60/40 split-folding rear seat; available ambient lighting; soft-touch dash materials, and more. Other notable features include Electric Power Assist Steering (EPAS); front, side, and class-exclusive knee airbags; and available SYNC technology. Also of note: The silver fog-lamp looking things: They're apparently LED light strips. That's pretty cool. First impressions suggest that Ford has a winner on its hands. Now we'll have to see if there are enough takers in the U.S. Personally, I think it's the right car, the right time, and the right company. I'm sold on it based on it's merit, but I'm worried about the pricing. On that note, I want to see some base and mid-line models. The ones we've seen so far look like at least $17k for a manual with cloth up to $20k for auto and leather, and worth it (although the take rate for sedans at that price point will likely be dismal) but it's what the headline price for a no-frills stripper will be, as well as how much you can get for $14k manual/$15k auto, that spells success or not in this segment. I agree with nlpnt about the price mark issue. What kind of Fiesta can you get for $16,000? If the car pictured can be had for $16,000, they should sell well. I think the MPG rating deserves a big thumbs up. I love the black interior in the pics, the materials look quality, but I would have preferred fewer "bling" touches and accents. It's a little "busy" looking in there. The exterior styling is not as inspired as the interior....in these pics anyway. I, too, am interested to know how much the Fiestas will cost. We'll have to wait and see.